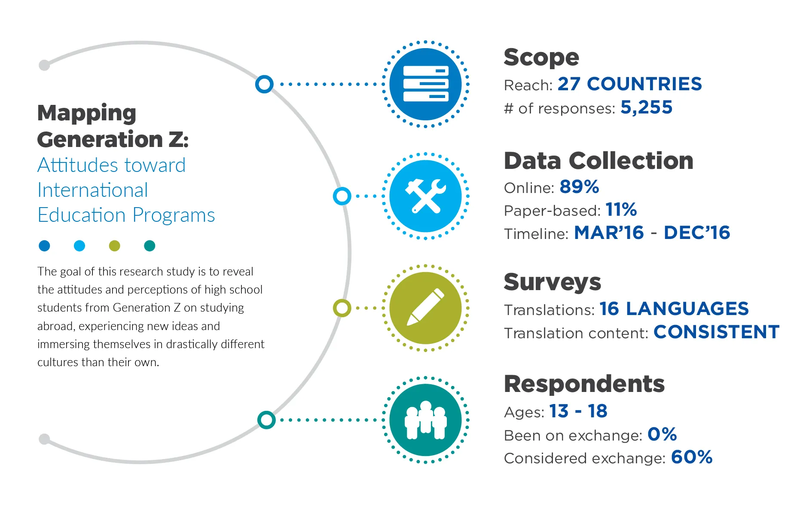 Below you can explore our new, global research report, Mapping Generation Z, focusing on the motivations for and hindrances to high school international study among students. The study was conducted by the Management Information Unit at AFS Intercultural Programs via a survey across 27 countries. The collection period was March 2016 through December 2016. The 5,255 respondents ranged in age from 13-18 years. With 77%, English speaking destinations (USA, UK, Australia) retain the highest attraction. By contrast, the two emerging markets featured in the survey (Brazil and China) show a lower favorability rating: 38%. This signals that today’s high school students have destination preferences similar to preceding generations in terms of education abroad. 33% of all respondents from emerging or developing economies indicate that they would not be able to afford an exchange abroad without receiving a scholarship. By contrast only 15% of students in Western countries report similar financial circumstances. This reveals that affordability remains a significant hurdle to school-level mobility in major parts of the world. Students worldwide respond that they are influenced primarily by program aspects, such as the reputation of the host country (77%), English as the language of instruction (69%), and the reputation of the host school (64%). By contrast, respondents assign lesser weight to the influence of traditional advertising (51%) and social media (42%). Countries where the research was conducted before May 2016 show a personal safety concern rate of 36%, while the following months (when acts of terrorism became frequent) yield a rate of 52%, which points to increased awareness of the global security situation. Security concerns supersede fear of social isolation (50%), homesickness (48%), and discrimination (34%). 57% of Latin American, 58% Southeast Asian, 72% North American, and 75% of European respondents expressed that their prevalent motivations to study abroad revolve around cultural exploration as opposed to academic advancement. Therefore, one could imply that the traditionally observed focus on academics in the developing regions is shifting closer to the attitudes of the West. Thank you for your interest in the Mapping Generation Z in Indonesia study. You can download the study HERE. For additional information or inquiries, please contact [email protected]. Millennials, What’s Driving You To Study Abroad?